← Granite Digital has just launched a new, fully responsive website for IT Tallaght. Are you stuck for ideas for finding that perfect Christmas present for the technology lover and gadget obsessed friend in your life? Well over the next 3 weeks Granite Digital will review the Top 10 Gadgets around, possibly giving you some ideas of what to get for the Techie person in your life. We will release several blogs a week in the run up to Christmas. Not just for the Tech heads but for everyone working in the office and desperately trying to bring a bit of the outside into the office. In around our office we all have little reminders to break up the monotony of the office. We have special screen savers to take us away from the fact that we stare at a computer all day, screen savers featuring a sunny beach, cloudy mountain tops or gently breezing meadows. We surround our desk area with photos of our families and friends, little toys and nik-naks all to create our own environment within the office. Now you can go a step further! Lean back, look at your space. Its small and you soon are back in the room once again, past your own screen saver. Now look up, what do you see? The dull fluorescent light, the plain square ceiling panels and that constant hum of the air-con, but wait! 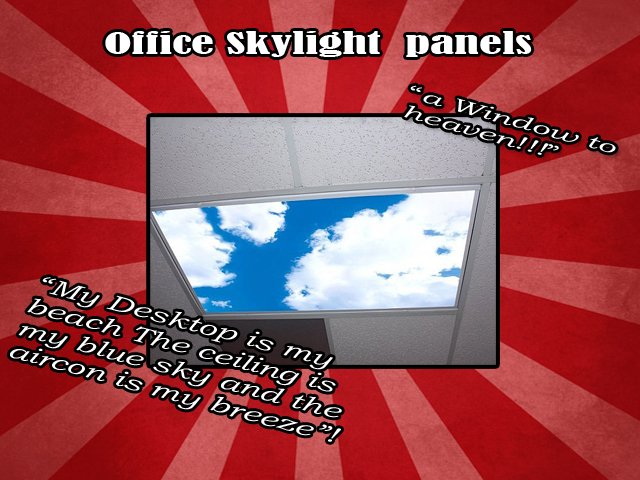 A new gadget called Skylight Panels will help change that, help to immerse you in a 3 dimensional world that transports you to that exotic Caribbean beach your screen saver always promises you and it can be found on Amazon for the average price of around €30. If you were interested and you can actually convince your boss to allow you to start changing panels in the ceiling, then we would recommend you seek a professional for help with the installation of this item. It will help to prevent your world from crashing down around you! And the Skylight Panels are just some of the latest gadgets that could make your Christmas wishlist. Join us during the oncoming weeks where Granite Digital will be looking at a variety of items including a USB/WiFi Pen(a great productivity tool that uploads everything writen onto word documents) as well as the latest Smartphones and accessories. We will also take a look into some of the top selling Apps for Android and IOS.